The Ensemble Vocal Stella Montis (chamber choir, 15 to 18 singers), was formed in 1994. Frédéric Serrano took over as director in 1998 and quickly elected to focus his repertoire on contemporary music. Meaning that for the past ten years and more, the choir has sung mainly modern-day composers (Mäntyjärvi, Godar, Pärt, Penderecki, Vasks, Tormis…) and also 20th century names such as Poulenc, Ravel and Debussy (performed this year). In 2014, the ensemble was part of the contemporary creation « Odyssée dans l’Espace » (Bordeaux Auditorium), performed in Latvia in the framework of « Riga, European Capital of Culture », and in December the Ensemble vocal Stella Montis dedicated a whole program to contemporary creation. The group’s presence at this first edition of Eufonia will be one of the highlights in 2015. Born in 1971 in Lorraine, Frédéric began his musical studies playing the piano, then the clarinet and finally ending up with the bassoon, which he discovered at the age of fifteen. In 1992, his love of singing (as chorister and soloist) led to his directing his first amateur choir in Cubzac-les-Ponts (the chorale Mélodia that he still runs today), his first foray into the world of choral arts. In 1998 he took over as head of the Ensemble Vocal Stella Montis. In 2003, he founded a choir at the University of Bordeaux II. In 2004 he formed a senior singer chorale in Talence and in 2006 began directing the Ensemble Vocal Arianna in Pessac. Since 2010, he has also been working at the Grand Théâtre de Bordeaux as part of the Ma Voix et Toi project. 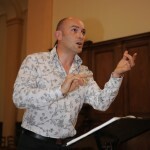 The diversity of the choirs he directs, from amateur status to a more professional level, has given him the opportunity to explore a vast range of repertoires.